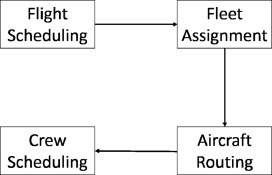 In this study, we proposed two mixed integer programming models for the integrated flight scheduling and fleet assignment problem based on a passenger discrete choice model. There are three contributions in this study: First, a mixed integer programming model for the integrated flight scheduling and fleet assignment problem is formulated in which more practical constraints are considered. Secondly, a mixed integer programming model is proposed to further incorporate itinerary price elasticity into the integrated flight scheduling and fleet assignment problem. It can provide some managerial implication for itinerary pricing in practical applications. Finally, various simulation studies are conducted to evaluate performances of our models and explore some managerial implication. The experimental results reveal that considering the integrated flight scheduling and fleet assignment can provide some profit improvement compared to considering the pure fleet assignment. Considering pricing elasticity could provide more significant profit improvement. This implies the potential advantages brought by considering pricing in the integrated flight schedule and fleet assignment problem. To efficiently solve models, a heuristic algorithm is also proposed and computational results reveal that our algorithm can efficiently solve all instances and achieve a better performance than CPLEX.